Australia’s foreign policy may be moving into a phase where it is no longer mostly above partisan politics. In October the Australian government stated that it would move Australia’s embassy in Israel to Jerusalem. This created a significant backlash, both in the Middle East and within Australia’s own neighborhood. Indonesia and Malaysia expressed their discontent, and the issue seemingly delayed the signing of a free trade agreement with Jakarta. The announcement seemed to be an amateur mistake made by new Prime Minister Scott Morrison as he looked to find his feet in his new position. Since then it appeared that he had learned such sensitive issues were more difficult than they seemed on the surface and were best left alone. 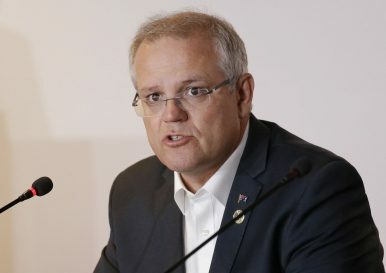 However, last week Morrison announced there would be an official shift in Australian policy by stating that Australia will recognize West Jerusalem as Israel’s capital, while maintaining the country’s embassy in Tel Aviv. It was the kind of compromise that placated exactly no one, upset almost everyone (including Israel), and only seemed to create confusion about what the government’s actual position is. If nothing else, it was a perfect illustration of how the Liberal Party is currently operating. While experts have addressed the pitfalls of this policy shift, what is most interesting is why the Morrison government felt compelled to address this issue at all. Why would the government be willing to create this kind of trouble for itself? And why would the government continue to pursue the issue after the trouble simply touching it caused in October? This is not just the bumbling action of an accidental prime minister; there is a larger phenomenon taking place, one that could have serious consequences for the way Australia conducts its foreign policy. Advocacy in Australia for moving the embassy to Jerusalem was not prominent until recently. Many people of Jewish background have a personal connection to the issue, and Christian evangelical groups associate the issue with biblical prophecy. Beyond this, far-right groups — while remaining anti-Semitic — have come to attach themselves to the status of Jerusalem (and the wider fate of Israel), aligning it with their worldview that fantasizes about ethnically and culturally homogeneous nation-states, while also tying the issue to their hostility toward people of Islamic faith. However, these groups traditionally did not have the power to influence Australian government policy, especially when the wider public affixed no great relevance to the issue, and the Department of Foreign Affairs and Trade saw meddling with the issue as only providing risks, no rewards. The calculus changed when U.S. President Donald Trump decided to move the U.S. embassy from Tel Aviv to Jerusalem in May. This transformed the issue from a minority concern to the official policy of the world’s most powerful state. Yet the issue should still not have been big enough for Australia to simply fall in line with the United States. The alliance would not have been affected if Australia had maintained the status quo. But foreign policy implications were not the driving force behind Morrison deciding to reconsider Australia’s policy. What we are seeing now is the influence of Trump on the Liberal Party’s position, not the United States’ influence on Australia’s position. As the dominant actor within the Republican Party, as well as president of the United States, and with a revisionist attitude toward both roles, the new norms Trump creates are not solely contained within the United States. His reshaping of both these roles resonates globally and conservative parties worldwide are bandwagoning onto these new positions as operational norms. There is a cross-border homogenization of conservative identity politics, as conservative parties take less of a localized approach to their policymaking, and instead adopt wider “bullet-points” that create an international conservative solidarity. Due to the way information is now distributed globally, there is seemingly an incentive to fall in line with the grander proclamations and ideological shifts of the Trump administration, as these positions form the vanguard of a new global conservative culture. This is why during the recent election in the state of Victoria, the Liberal Party inexplicably claimed it would shift Victoria’s trade office in Israel to Jerusalem, despite Tel Aviv being Israel’s economic hub. That the party used the slogan “Make Victoria Safe Again” also demonstrates how Trumpian norms are being internalized. These new conservative norms seem to have also influenced the Conservative Party of Canada, with it stating that the party will recognize Jerusalem as the Israeli capital should they win next year’s election. Brazil’s incoming far-right President Jair Bolsonaro now feels the path is clear for him to move Brazil’s embassy when he takes office, and Alternative for Germany politicians are attempting to push Berlin to do likewise. Yet what is most intriguing is the behavioral shift in the Liberal Party that this episode has highlighted. This behavior is not only threatening the national interest, but is a threat to the Liberal Party itself. Recent electoral events have indicated that the rewards that are being created for the Liberal Party on their social media accounts are being prioritized over the rewards at the ballot box. An incessant desire to signal to the in-group is taking precedence over both governing and winning elections. In this regard the merits of shifting the embassy in Israel don’t actually seem important. The position of the identity group is the defining element; the consequences are irrelevant. What this means for Australia’s foreign policy is that it may be moving into a phase where it is no longer mostly above partisan politics. As the new norms being created in conservative politics continue to exert influence on the Liberal Party, the party may decide it needs to further use Australia’s foreign policy as part of its identity signaling. Come the election in May the public will undoubtedly send its own signal that this behavior is unacceptable, but whether or not the party can comprehend this is yet unknown.